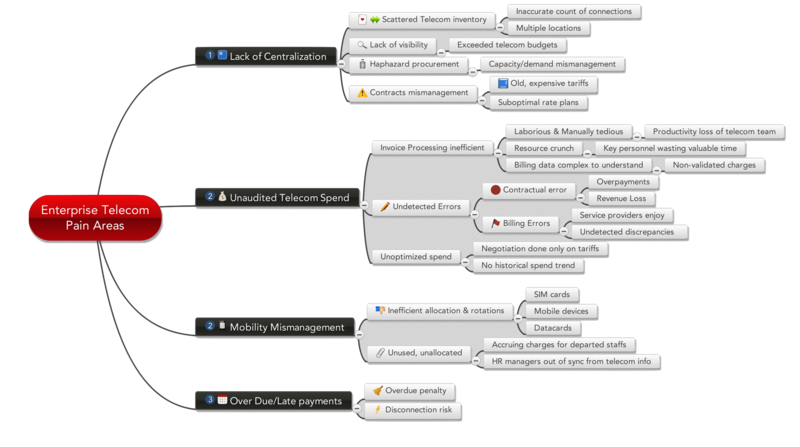 Telecom expenses are one of the major overheads [5th largest] of all corporate & often least understood & controlled. MNC’s, national companies and SME are keenly looking for ways to reduce telecom expenses and to gain control and visibility over their expenditure. To become competitive service providers often introduce new telecom products and services on a regular basis and companies are integrating them into their telecom infrastructure to maintain competitive advantage. Voice, data, fixed line, wireless, mobile applications, security, backup are just some of the product and service required by enterprise co-ordinate an integrated telecom process. The pure complications are leading corporate to look for total telecom management solutions. Enterprises telecom expenses are on an average in tens of thousands of dollars per month, still majority of them don’t have formal telecom policies in place, no program to deal with ever increasingly telecom spend. Surprising fact is that many of large organizations don’t know exact telecom spending. Telecom expenses are typically the 5th largest category of expenses on a company’s P&L statement, yet uncontrolled. View our 2016 brochure for an easy to read guide on all of the services offer. We are the leader in Telecom Expense Management space in India. With over 15+ years of experience we’ll ensure that you’re always getting the best guidance from the most professional company in the industry.